Rihanna has been having some fun on Instagram lately. 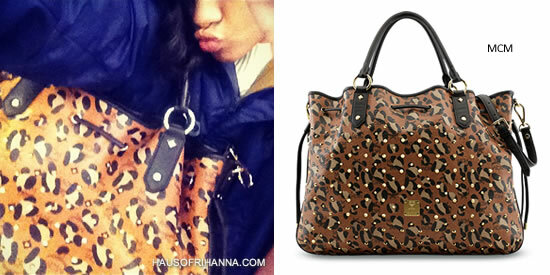 She took to the photo network to show off her new MCM drawstring leopard print tote. The large shopper, from the Fall/Winter 2012 collection, costs almost US$1900 and features gold studs and MCM’s logo. Rih also instagrammed a pair of sneakers that she received from her best friend. 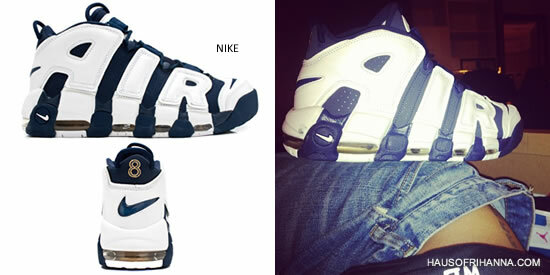 These are the Nike Air More Uptempo sneakers (available in black), a re-release of the ones that Scottie Pippen wore during the 1996 Olympics and have his number 8 stitched in the back. I dream of a world where people can be truly FREE TO CREATE, FREE TO SELL AND FREE TO WEAR, whatever they want, without any constraints. We need something new in order to progress. We need creation to exercize and liberate the mind. Living strongly, being determined, is how the world moves forward, and is how we can be free.